...[a] strange and striking debut novel ... Though this sounds like the set-up for a traditional coming-of-age story, DeWitt takes this premise into new, truly surprising territory ... Like Jean herself, the language in White Nights radiates heat. What Annie DeWitt does best in this book is center you in each moment ... More than a novel of plot, this is an atmospheric book, one that reads somehow like a Southern novel though it is set in New England ... there is a search for adolescence here from a woman who is both a teenager and a grown-up at the same time, and it is a marvelous, beautiful, and painful journey. White Nights in Split Town City mostly abandons the episodic structure of more traditional coming-of-age narratives. Instead, DeWitt’s supple observations take precedence over rote storytelling, yielding a novel notable for the delicacy of its moods. 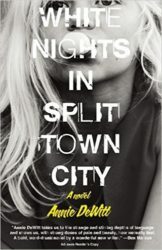 What did you think of White Nights in Split Town City?